It’s been a fun packed week of adventure and I am excited to bring you this special Wednesday edition of the newsletter. Super rare, one of its kind. You can’t mine it with your fancy GPUs because it’s made of an entirely different substance, the one that money can’t buy that takes as its mode of production the human spirit and creativity – I’m referring to yours rather than mine :). Outside of our thoughts our relationships are all we really have. Listening to our thoughts, expressing our ideas to others brings about a struggle for resources and an continuos debate on which ideas should be executed and how they should be reached. Stock markets are a relatively new invention largely fuelled by the development on electronic communication and computation. Modern markets are a product of the modern technological era. But as markets rush in to ever more efficient modes of operation they leave behind something very important which is the connection people need to feel before they transact. 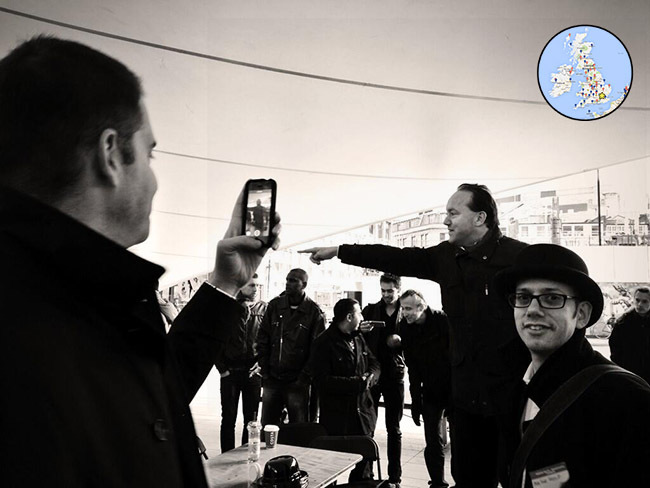 Bitcoin open outcry in Satoshi Square London was the central feature of Saturday’s meetup. Each event Ian and the team puts on gets bigger and bigger with new people joining with every event to learn all about the world of crypto currency. Interestingly we don’t see a drop off of past attendees. That is to say, once you go Crytpo you don’t go back. It’s non reversible oneway transaction. That’s right, a Bitcoin market place with instant withdrawals that actually work as expected! Sure there were some latency issues in the order matching process but this neat little experiment proved that market making is not as important as peoples ability to transact in tangible and meaningful ways. Voices were raised, preferences were revealed and the forward pricing mechanism gave rise to the invisible hand. Then, last night I had the pleasure of meeting with Mike Hearn of Bitcoinj fame. @Kevlar was getting all fangirlish and apparently I had to go talk to Mike and report back but he was undergoing a human DDoS and I didn’t really get the chance to say much. But what I can say is that I did have a very good meeting with someone from the London UX Design community, very prominent one, who has agreed to put on a Bitcoin Design meetup, stay tuned for more details. Is it a cat or a fox? But it was Michael Harrison of FeatherTipper fame who finally saved the day by looking at the div and could conclusively confirm that it was in fact meant to be a cat and not a fox as many people had thought. We are proud to be the hacker’s choice of coin. Feathercoin may not be as attacked as Bitcoin is but we are proud to take second place. So we say thank-you to the hacker and if he/she/they are reading this (and I think they probably are) could they please do us some neat ASCI art like the cat one and I would gladly pay in Feathercoins. We’d also like to know if you are available for hire for some other projects? But on a serious note our biggest threats lie inside of us. Hackers are every bit a part of our enterprise as we are in that they co-exist with us. Just because they do not share in our goals does not mean they do not strengthen our ability to reach them. On the contrary people are only capable of growing through many short, intense shocks. But intensity is nothing compared to the longevity of dedication. Intensity looks like noise on a time horizon stretched out by a group of individuals on a mission. Bush did a great job of painstakingly going through the code and getting the forum back up and running. It’s a thankless task so please take the time to consider how much time and effort this guy puts in. Always here, always ready to respond. Another guy you certainly can’t keep down is @Kevlar. He is focussing on a new project called Bitcoin Minus Bitcoin designed to attract new developers to the Feathercoin project and crypto currency more broadly. The idea for the name comes from Garfield Minus Garfield a project that reveals the absurdity of our lives and the existential angst we face. Provide a Github repository which contains all the dependencies, and scripts to automate building them all. A set of Visual Studio 2012 projects that is already configured with the dependencies which allows you to drop in your QT based wallet eg Bitcoin, Litecoin or Feathercoin. Compile it, make changes to it, run it on the debugger, do code analysis, and all the other great features that VS offers developers. The job of the leader is to give everyone on the ground the tools they need to achieve their goals. True power is local, great leaders make new leaders and this is exactly the kind of project we need. Checkout the State of the Union for more details. Along with easier to use tools for development we also want people to know that we are a bunch of people who know how to look good. Style is substance. Knowing how to look good is in itself a form of knowledge. And one of the first things people to as a signal of quality is your website and your design ethic. After a few months of reaching out to designers to put forward their ideas @Severino offered his input. Which one do you prefer? Have your say on the Website Development Thread or forever hold your peace. You may have missed our appearance on Rhett and Link. @Bush is a big fan of the show and asked the guys to talk about Feathercoin. I loved the way they thread in a bit of education on what money really is and how it works, they really captured the essence of our movement. It’s exposure like this that helps us grow as it brings a self selected audience to the community with which it can grow. Did you like the show, would you like to see more publicity like it? Send us your ideas. Please reach out to me in private if you have ideas you are not ready to express in the forum. Likewise if you want to be featured in this newsletter like the people above drop me a line. Today special thanks go to @Ruthie & @Kevlar for their contributions to this newsletter.